Online ordering for booth location and sponsorship opportunities is now available. The 2019 Floor Plan in Orlando offers excellent booth locations for everyone. If you don’t see the size of the booth you would like, please contact Mary Nokes nokesm@nasfaa.org to discuss merging booths. *Each 10 x 10 space includes one complimentary registration. Each multiple is 2 or 3 times the cost of a single booth respectively. 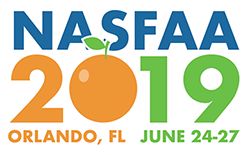 For all exhibitors, if you have a new product or service that has been launched since the last NASFAA conference, please include a 50-word or less description of your new product or service in the NASFAA User Portal when completing your other NASFAA required information. NASFAA will include a notation on the conference web site indicating you have a new product and/or service attendees may want to learn about. All products and services must be approved by NASFAA. A deposit of $1,500 per booth space and $2,000 for sponsorship is required at the time your order is submitted. A credit card may be submitted online at the time the order is placed or you may mail a check within 10 business days of submitting your order. If a deposit is not received within 10 business days of the order being placed, your order may be cancelled. Fifty percent of each booth space and $2,000 of all sponsorships are non-refundable. All cancellations of exhibit space, conference branding and advertising, or sponsorships must be sent, in writing, to NASFAA at nokesm@nasfaa.org by 5:00 pm ET on April 12, 2019. No refunds will be given after April 12, 2019 . No cancellations for sponsorships or advertisements are accepted regardless of date if materials have already been produced. No gift, giveaway, or raffle item can be valued more than $10.00. Rooms will be set for maximum capacity, theater size. No changes to the room set are permitted. A podium microphone, screen and LCD projector is provided by NASFAA. It is the responsibility of the company presenting the seminar to arrange for all other AV equipment. Company meetings may not be scheduled at times that conflict with any NASFAA Conference activities, except for those companies who purchase a package with a private meeting room. All requests for meeting space are coordinated through NASFAA. Submit any requests you have in writing directly to Jennifer Jackson, NASFAA Director of Meetings & Events at jacksonj@nasfaa.org. List will be sent to all sponsors, however all exhibitors can rent ($500) the list for use one time only. All sponsors and exhibitors will receive the final list via email. No email addresses will be included. NASFAA reserves the right to ask any exhibitor to adjust their listing as NASFAA deems necessary. NASFAA does not guarantee any given level of circulation or readership for the virtual trade show. The exhibitor assumes liability for all content, including text and illustrations of published information, and assumes responsibility for any claims arising therefrom made against NASFAA, including costs associated with defending against such a claim. Exhibitor agrees to hold NASFAA harmless for any claims made against it by reason of exhibitor's advertisement.